Here is the list of Best Free JT Viewer Software for Windows. These free software will help you open and view JT files easily on your PC. Most of the programs which support and open a JT file are paid and quite expensive. So, I bring to you a list of free JT Viewer which can open JT file as well as let you analyse your JT file easily. Some of these freeware will let you open a JT file directly and some need additional plugins to open JT file. All of these free software to view JT files mentioned here will let you move a JT model, rotate about its axis, as well as orbit to get a complete view. Some of these free JT Viewer even display the detailed information of the JT model. As you know that JT is an Open CAD file i.e. a 3D model format, developed by Siemens PLM software. It was developed to be used for product collaboration and visualization as well as data sharing. Go through the list to know more about these best free JT viewer software and also get to know how to open JT files. In this list of free JT Viewer, I prefer to use J2Go, as it is very simple to understand and lets me easily open and view a JT file. I was even able to analyse the whole JT model as well as its particular components with their detailed information. You can also check out the list of Best Free CAD Viewer Software for Windows, DWG Viewer Software For Windows, and BPG Viewer Software for Windows. JT2Go is a free JT Viewer, which you can use to view JT file easily. It is a very simple Viewer and it lets you load and view a JT file in its workspace. You will find various 3D model viewing tools here, using which you can Rotate, Zoom, and Show/Hide components of a JT model. At the left side of the interface, various components of JT file are displayed in a tree structure along with their details. One good feature of this free JT Viewer is that it lets you view different components of a JT file individually. This means that you can select a particular component of a JT model and view it freely. You can also hide/unhide different components of a model to view only selected components at once. This feature truly helps in analyzing a 3D JT model easily. It even lets you take Snapshots of the whole model or separate components. You can get Isometric, Top, Negative Isometric, Left, Front, Right, Bottom, and Perspective View of a JT model with this free software. Even the hidden and featured lines of a model can be viewed here. As this freeware lets you analyse JT file, you can measure distance, arc, radius, and diameter of various components or the whole model. You can even view clipping and cross-section of a JT model easily with it. For me, this freeware is good enough to view a JT file. I was able to view as well as analyse a JT file without any complexity. You too can use this free viewer to view a JT file on your PC. 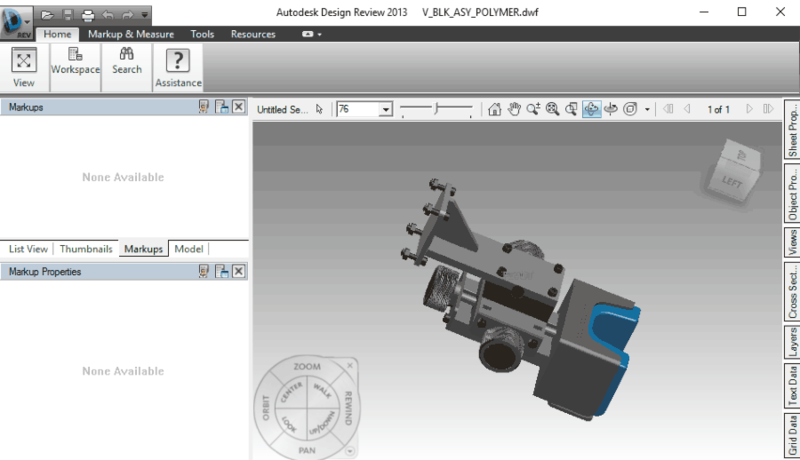 Autodesk Design Review 2013 is a free CAD software, which you can use as a JT Viewer. Although this freeware is a CAD software, you have to install JT importer plugin and add it to this free software in order to load and view a JT file. Download JT Importer Plugin here. Once you have added JT importer plugin to this freeware, you can easily use it as a JT Viewer software to open a JT model. To open JT file in Autodesk Design Review 2013, all you have to do is import the JT file using Import option. It will then load and display your JT model. Talking about the viewing tools, you can move a model from its axis or use orbit rotate or turntable rotate to get a good view of the JT file. You can even use simple zoom as well as rectangular zoom in order to view its different components, along with letting you Pan a model. It also lets you markup a JT model, where you can add text with formatting. This freeware supports options to measure length, arc, area, polyline, angle, point location, and radius on a JT file. 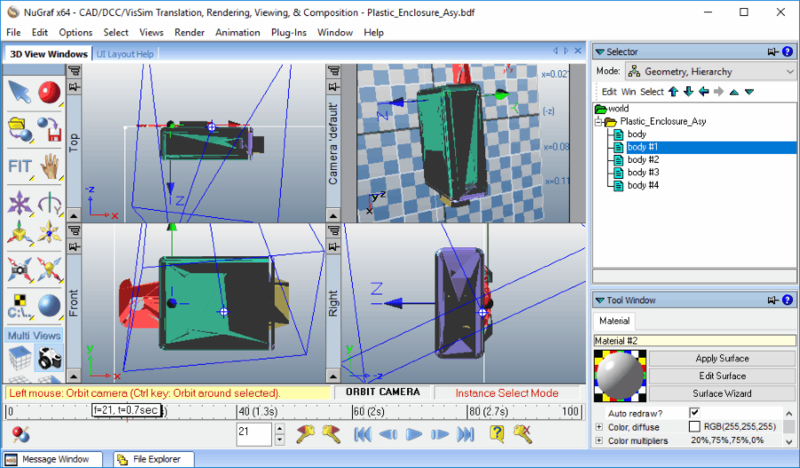 This freeware also displays model information as well as thumbnail view of the model at the left side of the interface. 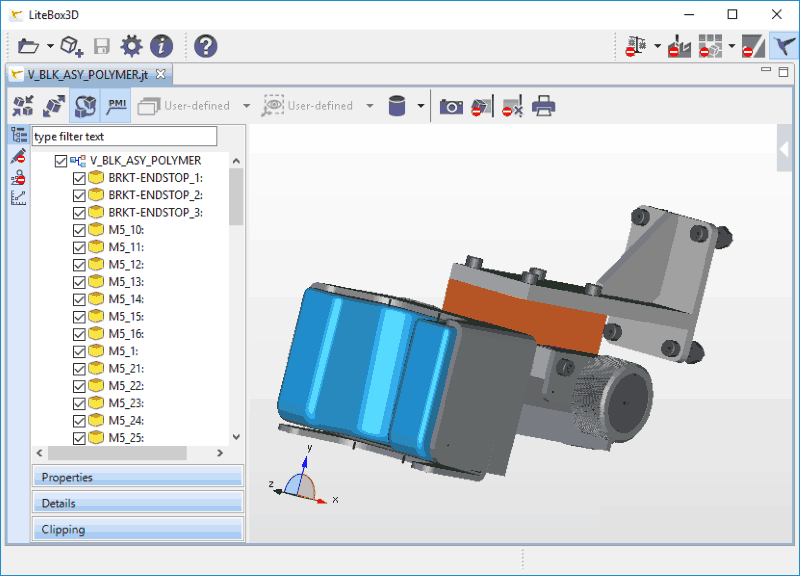 Apart from opening a JT file, you can open DWF, DWFX, DWG, DXF, PDF, BMP, GIF, RST, JPG, TGA, TIFF, and RLC files with this free JT Viewer software. You can even save a file in DWF and DWFX format along with saving markup summary of a CAD file as CSV. I will say that you can use this free CAD software to view a JT file along with other CAD files too. LiteBox3D is a free 3D file viewer software, which you can also use as a JT Viewer software. It has a simple interface with a bunch of 3D model viewing tools, which you easily understand and view a JT file. You can open a JT file in a new work-space or even insert a JT file to a pre-loaded CAD file. The tools available here let you move, rotate, orbit, and move a model about its axis. You can also get perspective or orthogonal view of a JT file. The visualization options supported by this freeware let you get shaded, textured, and wireframe view of 3D JT models. You can even take and copy snapshots of different views of a JT model to the clipboard. 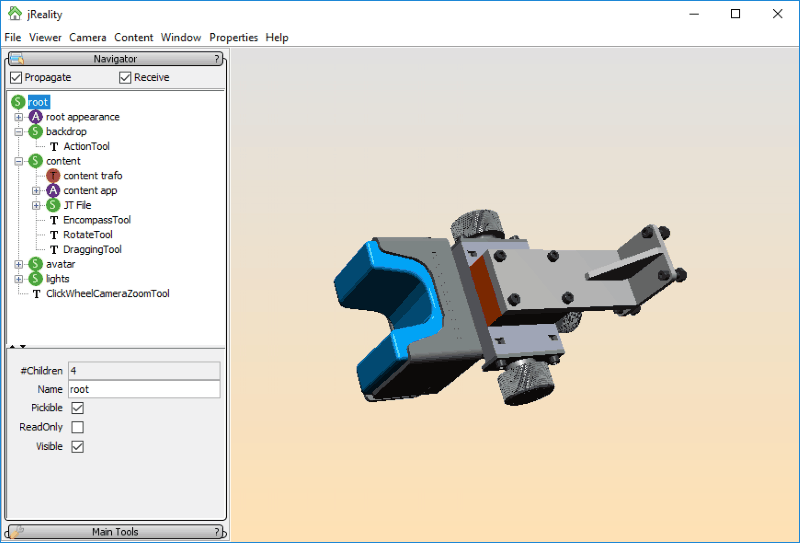 As this free JT viewer software lets you view different components of a model, you can search and select/deselect a particular component to view it. This freeware also displays detailed information of whole model as well as individual components at the left panel of the interface, thus giving you the liberty to analyse the loaded JT model freely. It was a little bit disappointing that some good features like topology analysis, redlining, and xcompare were not free with this free lite version of this JT Viewer, still it serves well to open and view a JT file along with its details. I will still recommend you to use this freeware to view a JT file. JTAssistant is a free JT Viewer software which is specifically built to let you open and view JT files. This freeware, being a dedicated JT Viewer, supports only JT format. 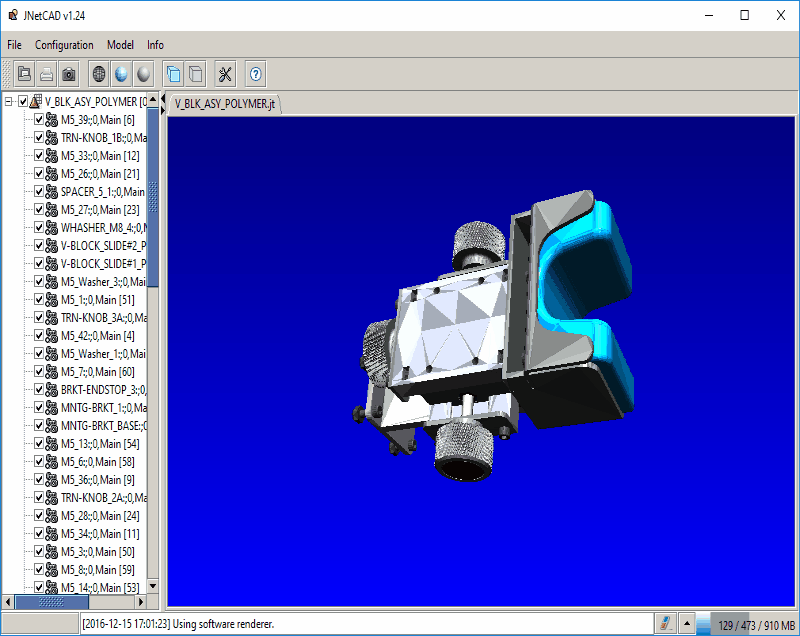 This lighweight JT Viewer has a toolbar, featuring tools to Dynamic Zoom, Rotate, Move, Perspective View, Top View, Bottom View, Front View, Back View, Left View, and Right View. Besides featuring options to view a JT model, it also displays model information at the left side of the interface. JTAssistant also lets you select/deselect a component, so that you can view their detailed information. 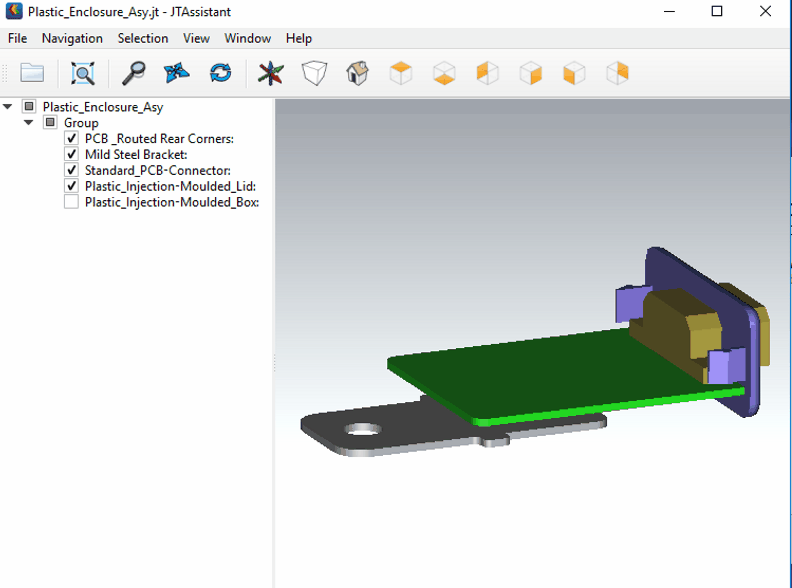 You can also selectively view or hide components of a 3D model here; this way it becomes easy for you to analyse a JT model and its components. I will say that JTAssistant is one good free software if you simply want to view a JT file along with its information. Okino CAD is one good free CAD Viewer software that lets you open JT Viewer software. To open a JT file here, you will have to download its respective plugin and install it (link to download plugin is available on the software download page). Once the plugin has been installed, you will have to import a JT file from import option to open and view it. As soon as a JT file is imported, the main interface of this free JT Viewer software shows 4 view of JT model, which is: Top, Front, Right, and Camera Default. You can use rotate, zoom, dynamic zoom, move, and pan tools to view a 3D JT model. There is one Fit View option, which lets you enable Orthographic, Fit to object, and Fit to Camera options to view a JT file. At the left panel of the interface, Render option is displayed to set various Render levels: Monochrome Wireframe, Color Wireframe, Hidden Wireframe, Hidden Line, Z-scaling, and Ray Tracing. Multiview option lets you have Top, Front, Left, and Right views of a model. At the right panel of the interface, Geometrical Hierarchy of the JT model is displayed along with File explorer and Camera View options. This freeware also supports a special feature called Polygon Reduction. It lets you reduce the number of polygons in one or more objects without sacrificing the object quality in single view or multi view. You can even delete selected polygons, and Hide/Unhide instance operations. Apart from opening JT files, this free JT Viewers lets you import other files, like: 3D files, 3DS, DGN, DWF, DWG, DXF, IGES, 2D Vector, Sketchup 3D file, VRML, etc. You can even export various 3D files to 3DS, JT, DWF, IGES, VRML, STL, etc. I will say, this is one good 3D Viewer that you can use to import, open, and view a JT file. JNetCAD is a free 3D Viewer software that you can well use as a JT Viewer. To use this freeware, you have to install JRE 7 (or later version) on your PC. Once you have installed JRE, you can easily run this free JT viewer and open JT files in it. 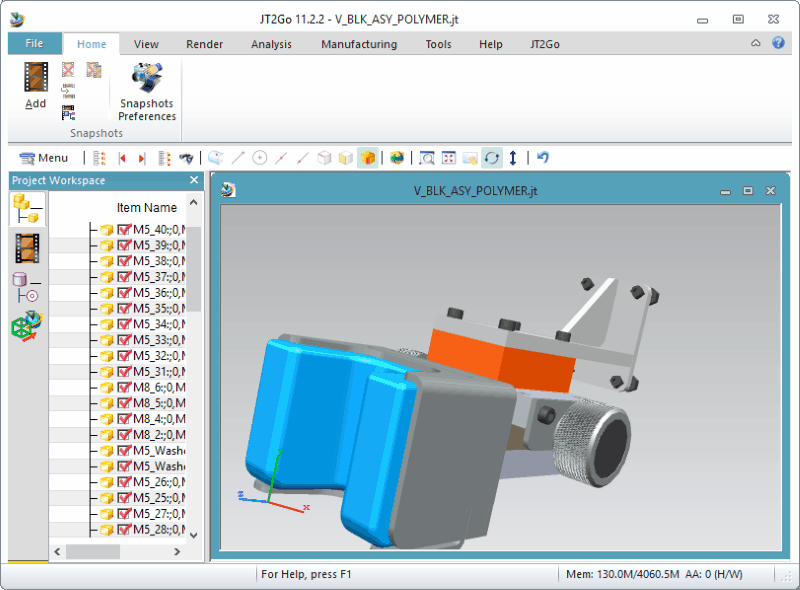 Being a simple 3D viewer program, it has a simple interface which displays JT models in its workspace area. You can use various featured tools under the Menu options to view a JT model. To get a good view of a JT model, you can use the available tools to rotate, move, and zoom models as per your need. A model can viewed from Top, Front, Left, Right, Bottom, and Back sides. You can also view detailed information of a model at the left panel of the interface. You can view the information of the whole JT model or its components. In order to view information regarding a particular components, you can select/deselect a component. Besides JT files, you can also open various other CAD files, like: DXF, BGF, OBJ, and STL. You can even use it to save your files as DXF, STL, PDF, OBJ, EPS, JT, or JSON, thus serving as a CAD file converter too. Apart form saving and converting a CAD file to different formats, you can use this free JT Viewer to export a JT file as image. Jreality is a free 3D Viewer that you can use as a JT Viewer software. To run this free software on your PC, JRE (version 7 or above) is required. At the left panel of the interface, there is a navigator window, which shows the information of a JT file in a tree based hierarchy. From this tree, you can select/deselect components of JT model to view them separately. You can rotate and zoom a 3D JT model freely. Options to change background and hide mouse pointer are also available. Here you can save your JT file in XML or JRW formats.